The Kitsune are fox Ayakashi. The more tails a Kitsune has—they may have as many as nine—the older, wiser, and more powerful it is. Historically, a Kitsune may take on human form, an ability learned when it reaches a certain age -usually 100 years. Kitsune are believed to possess superior intelligence, long life, and magical powers. In modern times Kitsune have learned to shapeshift to a human form in their childhood. Kitsune may also be exposed while in human form by their fear and hatred of dogs, and some become so rattled by their presence that they revert to the form of a fox and flee. Flames made by Kitsunes are called kitsunebi. Other supernatural abilities commonly attributed to the Kitsune include possession, mouths or tails that generate fire or lightning (Kitsunebi), willful manifestation in the dreams of others, flight, invisibility, and the creation of illusions so elaborate as to be almost indistinguishable from reality. Some have even greater powers, able to bend time and space, drive people mad, or take fantastic shapes such as a tree of incredible height, or a second moon in the sky. Other have characteristics reminiscent of vampires or succubi and feed on the life or spirit of human beings, generally through sexual contact. 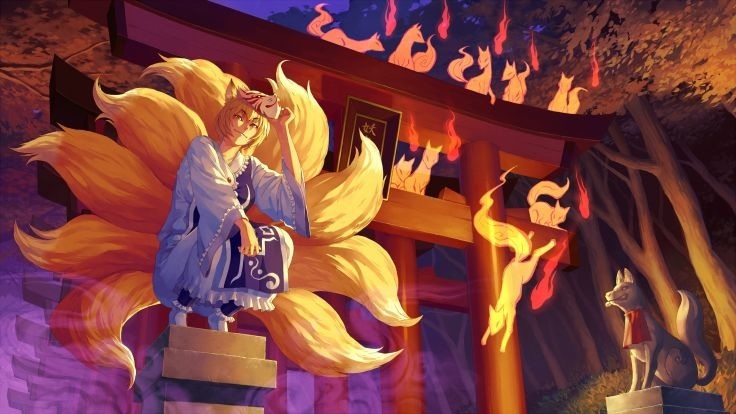 The Kitsune’s original form is a fox, but most find it easier to be in a half-human half-Kitsune form, meaning that their appearance is humanoid but for their tail(s) being visible. ​Generally, a greater number of tails indicates an older and more powerful fox: theey can grow additional tails even after having lived 100 years. 1, 5, 7 and 9 tails are the most common numbers. When a Kitsune gains its 9th tail, its fur becomes white or gold. These Kyubi no Kitsune gain the abilities to see and hear anything anywhere in the world.